On behalf of the entire Publications Committee, I thank all who have responded to our request for information about the date of delivery of AR to members’ addresses. As I prepare this Editorial, we had received replies from 163 members for the June issue, 186 for July and 102 for August, with us expecting to receive a few more for August, especially from areas a little further out from the capital cities. Whilst we have yet to examine the data in detail, it appears that most members are receiving their copy of AR within a reasonable time from the mailing date. It appears that Australia Post does a reasonable job of attempting to meet its delivery guidelines. There are always a few exceptions, but we would need to undertake a major exercise to attempt to identify the causes of those unusually late deliveries. Ernie Walls VK3FM reports that many respondents have included some nice comments on the magazine – we all thank you for the compliments. You might ask “What prompted this short survey?” We have received a small number of comments regularly from members about the delivery date of AR to members’ homes. A little deeper investigation usually reveals that the major issue is not so much the actual date of delivery, but that some are annoyed that they see the magazine on their local news agency stands a day or more before it appears in the mailbox. I appreciate that this might be a little frustrating for those so affected. The problem comes about because of the delivery mechanisms. 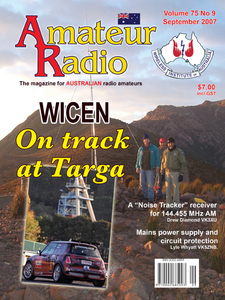 All member copies are posted through the Australia Post distribution network. The expected delivery times can be established by looking through the appropriate documents on the Australia Post web site. For most areas of Australia, delivery should take a maximum of seven (7) days, unless you are at the further reaches of this large continent. Our data shows that for each of the three months for which we have data, these deadlines have been met except for a very small number of later deliveries. Copies ofAR going to the news stands are delivered in bulk to one of the major magazine distribution companies. As the distribution of magazines to the retail outlets is the speciality of this type of company, they have developed extremely efﬁcient distribution systems. Part of the efficiency, compared to Australia Post, is that deliveries are only made to a relatively small number of outlets in each town. On the other hand, magazines delivered via Australia Post make up a small proportion of an overall huge quantity of mail items delivered to essentially every household across the nation. Together with our publication house, Newsletters Unlimited, we are exploring ways that may allow for the earlier delivery of AR each month. There are many factors involved and it may take some months before we reach our goals. However, even if we do our best, some members might still see the magazine in the shops before it is in the mailbox. We therefore ask members to be patient – all involved are working as best we can with the systems available to us. In VK, it seems that August was contest month. I trust that all enjoyed their participation in the three major weekends of activity: the RD Contest, the ILLW and the ALARA Contest. Having participated, you should make the extra effort for the two contests and submit your logs. It really does not matter if you will not win – by submitting your log, you show that you have supported the goals of the Contest. I know that each extra log means additional work for the Contest Manager, but I am sure that it is work that they really appreciate. It is the lack of logs that the managers usually find frustrating – why go to all the effort of reﬁning the rules, distributing them to multiple outlets, and sending out news items to magazines, clubs and the broadcast team, only to see a small number of logs entered. More logs show that the news has been heard, and indirectly the efforts appreciated. Check the Rules – make sure the log is in by the deadline! Page 6 - Mains power supply and circuit protection (Fuses and circuit breakers), Lyle Whyatt VK5ZNB. Page 8 - Building a variable inductance oscillator, Leon Williams VK2DOB. Page 20 - Silencing the Toyota 100 series diesel RFI, Bob Tait VK3XP and Phil Wait VK2DKN. 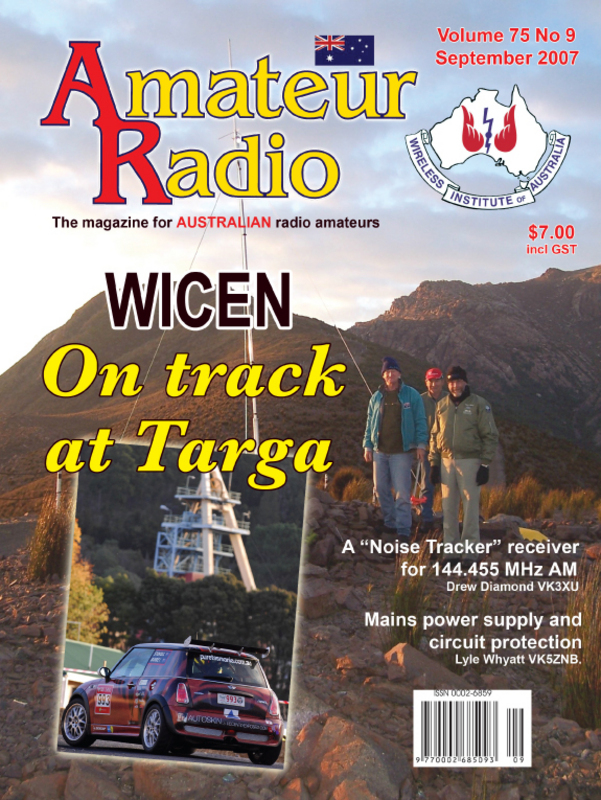 A report on the involvement of WICEN Tasmania in providing communications support for the popular Targa Tasmania car rally. The author explains some basic matters regarding the EchoLink system. Another delightful article from a regular contributor: Drew describes a simple receiver working at 144.455 MHz and a simple hand-held Yagi antenna that can be used to find the source of interfering noise from power line systems. The article includes instructions on how to use the equipment. The authors explain how to silence the ignition system noise from the Toyota 100 series vehicles. Read the complete article by downloading the pdf file below.